The EX series provides high levels of power at surprisingly low cost. The attractive case style is highly compact using the minimum of bench space. The fan-less design provides silent operation *. The low weight makes them easy to move about. The EX series combines switch-mode pre-regulation with linear post-regulation to provide performance comparable with an all linear design. Excellent line and load regulation is matched by low noise and good transient response. High power efficiency makes fan cooling unnecessary *. 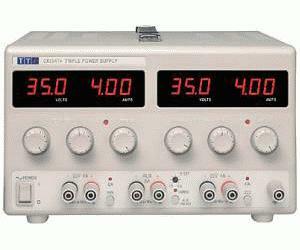 The EX series incorporate separate digital voltage and current meters on each main output. The meters use bright 14mm (0.56") LED displays and have an update rate of 4 per second providing near instantaneous response. Simultaneous metering of voltage and current provides accurate information “at a glance” and avoids any possibility of misinterpretation. When an output switch is set to “off”, the current limit setting is displayed enabling conditions to be set before the load is connected. The EX354Tv incorporates a third output variable between 1.5V and 5.0V with a fixed current limit of 5A. The set voltage can checked using the digital displays. The best-selling EX354T has been replaced with the EX354Tv, offering fully variable output voltage on the third output.